Do you work in my Industry, Geography, etc. People HAVE been trying to build a purely visual development language for years, but other attempts have only yielded partial success. Today, there are quite a few visual development tools on the market, but all suffer from some limitation or another involving lack of access to the data layer, lack of logic capabilities, or lack of presentational capabilities. he problem with security is that every new application; …is built by a new team, …using different tools and methods, …to build different code, …that includes different security vulnerabilities, …and therefore needs its own security testing, …and ultimately needs its own remediation. Solution: Eliminate application security concerns at the platform level. The WorkXpress architecture allows developers to build applications that pass application-level security tests…AUTOMATICALLY. All WorkXpress applications are hardened against things like SQL injection and XSS cross-site scripting. How? WorkXpress is a secure platform with a unique, proprietary architecture. Because of this, the applications built on top of WorkXpress do not need to be independently penetration tested - they are automatically secured according to level of security applied to the platform itself. Supported infrastructure offers compliance including SAAS70, Federal, HIPAA, HITECH, PCI and more. WorkXpress support both public and private cloud servers. From the WorkXpress perspective, a private cloud server is any OVF-compliant virtual container designated as an “appliance” and provided the WorkXpress private cloud appliance URL. YES! WorkXpress applications are html 5 compliant meaning that any modern browser on any mobile device is capable of viewing WorkXpress application - natively - without any additional effort on your part! For tablet size devices this is frequently acceptable with little or no extra effort. However for smaller form factor devices such as PDA phones this is only practical for limited use. For these smaller devices, WorkXpress builders will create smaller form factor screens and interfaces targeted to PDA phone users, leveraging the same powerful WorkXpress development tools as used to make larger form factor applications. It is important to note that with iOS6 and with the expanding capabilities of html 5, browsers are being given increasing levels of control over the device functions themselves, such as taking pictures, accessing the GPS system, offline data storage, and more. Because of this, browser based applications are increasingly worthy competitors to native applications, which themselves are much more expensive to build and maintain across a wide range of platforms and devices. WorkXpress continues to invest in empowering its builders with the capability to rapidly and effectively build world class mobile solutions. WorkXpress relies on a variant of the LAMP stack. LAMP stands for Linux, Apache, PHP and MySQL. Linux accounts for about 80% of all web servers used in the world. Apache powers approximately 60% of all web sites. MySQL accounts for approximately 40% of all database usage by developers globally. PHP is used by approximately 78% of all web servers utilizing server-side programming languages. Why did we choose the Percona variant of MySQL? Quite simply, Percona is an actively worked, high-performance variant of MySQL, branched prior to the Oracle acquisition of MySQL, and which is well supported by some of the original MySQL storage engine developers. It is an excellent choice for enterprise grade MySQL. The two key tenants of WorkXpress are “choice” and “empowerment”. We want to empower you to make all manner of choices about how you build and deploy in the cloud. By turning your existing IT teams loose on a 5GL PaaS environment, you will greatly enhance your organizations software automation capabilities and responsiveness to change in your business environment. What's more, you can make the choice to empower your business teams as well, while maintaining centrally key aspects of control, security and oversight. 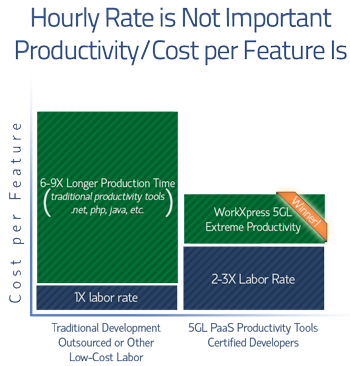 WorkXpress is the ideal tool to deploy as the standard platform environment in your organization. If you standardize around WorkXpress, your organization will become a more potent and flexible competitor. Use WorkXpress's code documentation feature to provide a highly detailed specification document to your new development team. This will give them a very specific map to follow that doesn't leave out any details. hundreds of pre-built non-programmatic integrations such as credit card gateways, shipping tools, geocoding, and much more! By default, each WorkXpress application comes with significant high-availability features including those provided by the cloud infrastructure vendor, such as Amazon Web Services. These default high availability options are suitable for most organizations. However, some organizations may require custom architectures that could include things like multiple servers, separate zones and even a span of multiple private clouds. Each of these unique high availability solutions are possible with your WorkXpress Enterprise License. WorkXpress supports UTF8 character sets. So, you can build your application and store user data in any language that you like. 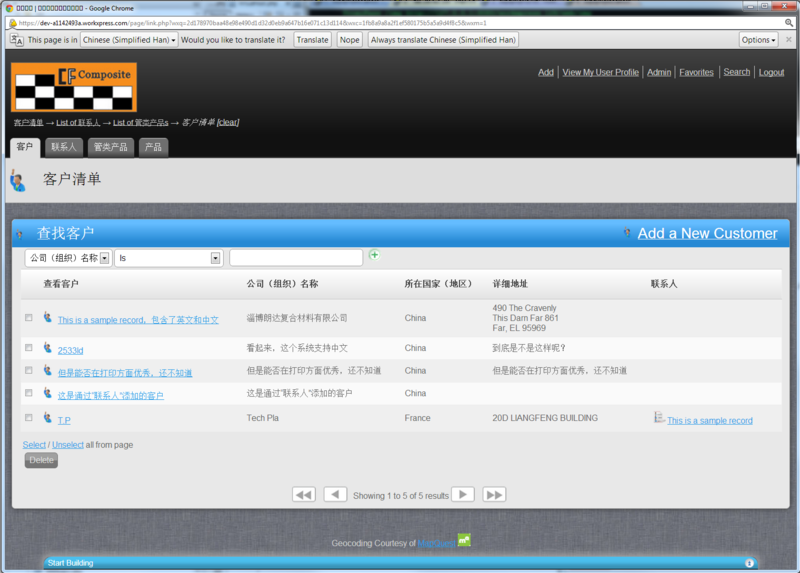 Don't forget to use our language translation web service action if you need to do translations. Note that the WorkXpress engine itself is written in English. This means that the development tools are also in English. Finally, in any dynamic, evolving product it's possible that some aspect of your deployed application defaults to English. Please if you run across some area of the engine that needs our attention, let us know, we'll get it folded into the multi-lingual system for you. Here's an example of an application in the building process, using a Chinese dialect. WorkXpress supports a wide range of communication integration's, and specifically telephony integration's. As a result, WorkXpress based applications enjoy orders of magnitude savings over telephony systems deployed even as recently as just five years ago. Integrate with leading cloud based telephony providers such as Skype. Many of these providers support use of traditional VOIP-enabled telephone equipment, allowing the user to interact with a traditional telephone in a traditional manner, while maintaining the benefits of a tight telephony integration to your software application. Integrate with a VOIP-enabled PBX system. For example, if you use a local Asterisk-based PBX system your WorkXpress installation can generate inbound screen-pop's, outbound calls, and much deeper types of integration. WorkXpress provides native Interactive Voice Response (IVR) capabilities via 3rd party service providers. Use these capabilities to develop an automated dialing and message delivery, a touch-tone based response system, and even predictive dialing capabilities. WorkXpress embraces the legal concept that “Data submitted to the service belongs to you”. In other words, anything you submit to the service, including your application “code”, will belong to you. WorkXpress provides tools to help you retrieve your code and your user data at any time. WorkXpress is a privately held company incorporated in the State of Pennsylvania in the beginning of 2003. WorkXpress has not accepted venture capital, and enjoys a healthy revenue stream from satisfied customers. Over 35,000 unique individuals log into WorkXpress based applications, from countries all around the world. In recent years, WorkXpress has enjoyed greater than 50% year over year growth. WorkXpress board members include George Fischer, EVP Worldwide Sales CA http://www.workxpress.com/media-a-releases/88-workxpress-paas-names-george-fischer-to-board-of-directors and Bob Joyce, President, Versatile Inc. http://www.workxpress.com/media-a-releases/87-bob-joyce-announced-as-new-workxpress-paas-board-of-directors-member-. Cloud choice - host your servers wherever you like including public clouds and behind your own firewall. In this way, any failure to provide services won't immediately impact your business operations. Rapid migration - WorkXpress provides data extraction tools and code documentation tools to minimize the difficulty off migrating to alternate technologies. Source code escrow - For Enterprise clients, WorkXpress is able to provide the ultimate in risk-mitigation, source code escrow. Any triggering event such as failure to provide services will trigger the release of the necessary code you may eventually need to maintain your operations. WorkXpress Terms of Service are found here; http://www.workxpress.com/terms-of-useand are executed online by any user of a WorkXpress Platform Account. An easy way to divide the world is as follows; traditional code versus no code. All of those terms above are forms of traditional software development code. Any vendor you speak with who is not a WorkXpress vendor by default must be working with a traditional development language. Some of those vendors will do better for you than others, but if you aren't a trained software expert, it will be hard for you to predict the difference. Remember, in a traditional code environment it is important to identify every detail of your project in advance, because changing things after the fact is expensive and difficult. WorkXpress believes that having to work directly in these complex technologies is the source of the remarkably high failure rate of software development projects such as yours, and so we make things so much simpler. We incorporate many of those terms mentioned above, however, no one ever has to work with them in their native form. WorkXpress is so much easier!! WorkXpress has clients in most industries and has deployed solutions across most business functions. However, WorkXpress solutions are not designed for what “an average company in your industry needs”. Better than that, they are designed for your specific company. The most important aspect of your WorkXpress deployment is to share and brainstorm at a detailed level the specific requirements of your business, NOT the general requirements of the average company in your industry. Too often, software companies choose sales and growth over product quality and completeness. WorkXpress has benefited from almost a decade of dedicated research and development, to the exclusion of wide scale marketing. This intensive focus on R&D and on making successful customer engagements has enabled it to become the worlds first 5GL Platform as a Service. As an IT Services provider, your future rests in building a base of happy, profitable customers. We recommend that you provide your customer a head-to-head choice between various options, and let them decide what is best for them. For custom development projects, you won't build a happier, more profitable customer than with WorkXpress. Not any more. Recent analyst reports are suggesting a 14% rate of PaaS adoption. This number is significant because it means the technology has entered the “mainstream” of software products. PaaS has definitely “crossed the chasm” and is now accepted in the mainstream. he entire market for business software and services is $1.3 Trillion; the part of that market represented just by Software is only about $300 Billion. However, keep in mind that today's software market is largely broken; there is a failure rate of almost 1/3 of all projects, and an unsuccessful-project rate of approximately 1/3 of projects, leaving only approximately 1 in 3 buyers satisfied with their current software spending. On average, most companies spend about 1/4 of their software budget on custom software solutions. This suggests the total market addressable by 5GL tools is as large as $75 Billion annually for custom solutions, but $225 Billion annually for pre-built solution based on a 5GL PaaS. It further suggests that at least $50 Billion in custom software spending is currently resulting in dissatisfied customers. Of note, a recent analyst projection for the size of the PaaS market was $15 Billion by 2015, suggesting that PaaS is expected to deliver as much as 20% of all custom software engagements in the very near future, or 5% of all software. A Microsoft study suggested that for every 1 technician who can write code, there are 100 people capable of working in less complex tools. In other words, 5GL technology empowers 100 new people to enter the workforce for every 1 person there today. One reason businesses ONLY spend $300 Billion/year on software is because of the enormous dissatisfaction rate with software (apx. 66%). WorkXpress management estimates that the average business uses software to automate only 33% of its business processes and operations. In other words, if software were more successful and affordable, businesses would spend even more on it. Clearly, the market for 5GL PaaS exists, is already showing rapid growth, and has enormous potential to increase the size of the overall software market. Two recent estimates of PaaS market growth are >100% annually, and 67% annually.